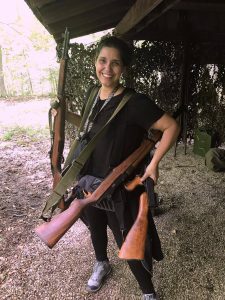 GCFC Member, volunteer, and local crew member Vanessa Capella may not have been born in Cleveland, but she is still just as proud to call this city home, and is passionate about helping the Greater Cleveland Film Commission create jobs. In her research, Vanessa found out about the GCFC and our work to create media production jobs in the region. Vanessa first got involved with the GCFC by volunteering for our Annual Behind the Camera Fundraiser with Tom Hanks in December of 2016. She also attended Tri-C’s Intensive Film Crew Training taught by industry professionals, adding that it was the “best workshop” she had attended. 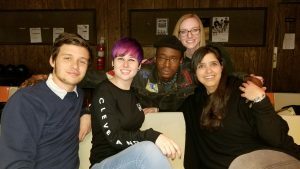 From the “Native Son” Wrap Party: (Left) Actor Nick Robinson (“The Kings of Summer”, Des Matelske, Actor Ashton Sanders (“Moonlight”), Katlyn Neylon, and Vanessa Capella. Vanessa is currently working on The Last Summer as it’s winding down filming this month. To become a GCFC Member like Vanessa and support film in Cleveland, click HERE! Your membership creates a direct economic impact by making the GCFC’s movie attraction efforts, workforce development events, and our statewide advocacy all possible.